Makerere Hill Road under construction. Photo by Raymond Mayanja. 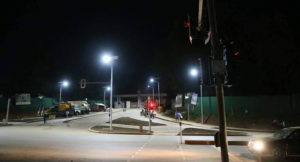 KAMPALA–A new survey report has revealed that 90% of the city dwellers are satisfied with Kampala Capital City Authority (KCCA) improved works on roads, signalised junctions, street lights and walkways. The findings were conducted by the Technical Assessment and Customer Satisfaction Survey and released at a workshop organised by the World Bank on Friday. Some of the work projects in the city under constructions are funded by World Bank under KCCA’s KIIDP 2. The survey shows that the city dwellers are happy with on the ongoing road constructions at Fairway, Bwaise, Bukoto, Makerere, Nakulabye, Bakuli and Kasubi. About 1,000 city dwellers from Kawempe, Rubaga, Makindye, Nakawa and Central divisions were asked to assess KCCA construction projects. The city dwellers are satisfied with the reduced traffic jam, with about 60% of the road users in Bwaise showing appreciation. “There is an improved traffic flow of traffic and less traffic jam because of newly constructed signalized junctions. And also reduced accidents at signalized road junctions,” said Ali Musoke, a motorist and resident of Katale zone, Kawempe division. Previously, Bwaise was one of the areas known for traffic jam during morning and evening hours. In the field of security and night visibility, the street lighting along the roads has improved. To some of the residents in the informal sector, the report shows that they no longer fear to move at night because the roads have security lights. Residents also said the projects have changed the image of Kampala city. About the floods and sanitation, 83% of the residents residing in Kawempe division said have reduced as a result of improved road drainage system. They made reference to areas around Bwaise Junction and Kiira-Kabira junction in Bukoto, Makerere Hill Road, as well as Fairway Junction. At the workshop, Barbry Keller, a Senior Operations at the World Bank, in her opening remarks, said the management observes KIIDP2 as a progress. Martin Onyach Olaa, the Task Team Leader, World Bank office Kampala, said KIIDP2 made remarkable progress but needs to step up its implementation of the remaining half of the project. The report, however, identified low fund utilization, including delayed acquisition of land along planned road construction sites, among the challenges faced. It recommended early resolution of land acquisition ahead of road construction and called for engagement of utility service providers during the project planning phase in order to gain a clear understanding of the extent of utility interferences; cost and duration for relocations.